« Don’t make me eat alone in New York! The second weekend of June is going to be great! 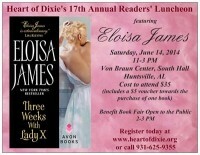 First, on Saturday, June 15th, Heart of Dixie presents its annual Romance Readers’ Luncheon with the amazing Eloisa James and 25 other authors. Then, on Sunday, June 15th, join me and Tor editor Whitney Ross for the Writing Good Books That Sell! workshop at the Huntsville-Madison Co. Public Library. In addition to great advice for writing great books, Whitney will be doing cold read critiques of participants’ manuscripts. It’s only $10! It’s going to be a great weekend. Hope to see you there! This entry was posted on Thursday, March 6th, 2014 at 11:16 am in News. You can feed this entry. You can leave a response, or trackback from your own site.